High ceilings and exposed brick in our historic building are accented with modern tech and chic furnishings in the perfect downtown location. 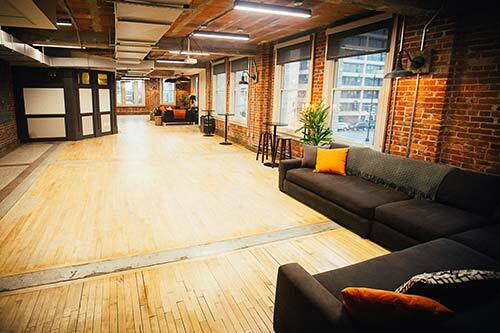 The Loft at 600 F is the premier DC boutique space and served by concierge-level event services and staff. Walking distance to Convention Center (0.5 miles) and across the street from the Verizon Center. One, two, or three floors can be set from a chic lounge to a formal conference table or from a engaging lecture or discussion panel to larger corporate happy hours or group parties. 600 F Northwest is perfect for day retreats, corporate meetings, and training seminars by day and ideally suited for evening cocktail hours, weddings, mitzvahs.